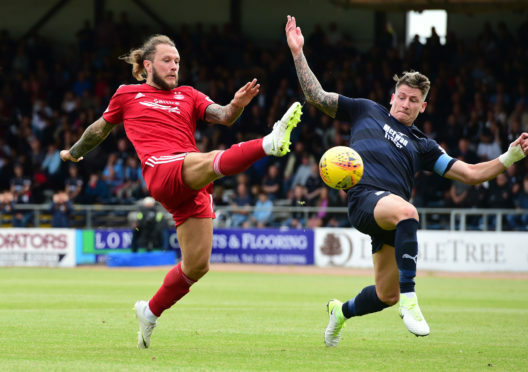 Derek McInnes sees Aberdeen striker Stevie May getting close to the form that made him a household name with St Johnstone. May has struggled with fitness and form since joining the Dons a year ago, with just five goals in his first season and one since last November. However, McInnes was impressed with his display in the 1-0 win against Dundee and has seen a difference in May since his return in the summer. He found the net four times in the first half of the last campaign before an ankle injury sustained against Rangers kept him out for the best part of two months. Sam Cosgrove started this season as McInnes’s main man and the addition of James Wilson will increase competition further. But the promising signs were there for the Aberdeen boss in May’s display last Saturday. McInnes said: “When you look at where he’s come from, it was maybe a bit ambitious for us to expect him to pick up where he left off. We’re trying to get that instinctiveness and hunger back to score those goals. I have seen a difference since he came back for pre-season – there’s more intent to his game. “He needs to be more selfish and that maybe goes against his natural instincts. The best number nines are out on the pitch for themselves. There’s nothing wrong with being a good team player but I’m hoping he can be a bit more single-minded. Getting the deal for Wilson over the line this week has eased the burden on May and Cosgrove but it has been a frustrating summer for McInnes in pursuit of a striker. Eoin Doyle, Christian Doidge and John Marquis have all been on the Dons’ radar but they have often found themselves priced out of deals. McInnes added: “In England it’s the consequence of the monies in the top flight. It can maybe put false value on other strikers. Clubs are well within their rights to put values on their players, as we do. But there’s nothing on the out-of-contract list that would have improved us. “You then have to look at the loan market and buying players. We’ve had half a dozen offers go in, for players at home and abroad, and it’s not been enough. The loan market is where we’ve managed to find James and win this fight.